Lately, I have been thinking about the future of Natewa Bay, located on Fiji’s second largest island of Vanua Levu. At 600 square miles and over 1000 meters depth at its center, Natewa Bay is the largest deep-water bay in the South Pacific. When I Googled "Natewa Bay" thirty days ago, there were 1820 separate results. At the time of this writing, there are 2940 entries. (Author's Note: In early 2012 there were 58,600 results) Clearly, it is a place that is being discovered by many people from all over the globe. It is there that I have a problem with New World Group's plans. 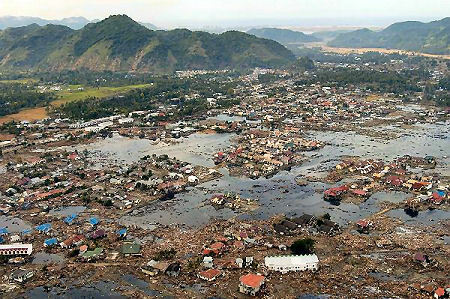 Anyone who remembers the December 26, 2004 Indian Ocean Tsunami will recall that the greatest damage was experienced at the head of oval shaped beaches or bays. 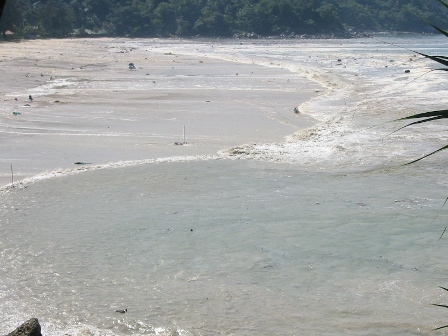 As most people know, when the causative earthquake or underwater landslide is lined up with the mouth of such a bay, the tsunami's effects are magnified as the wave pushes into the shallow, constricted waters at the head of the bay. 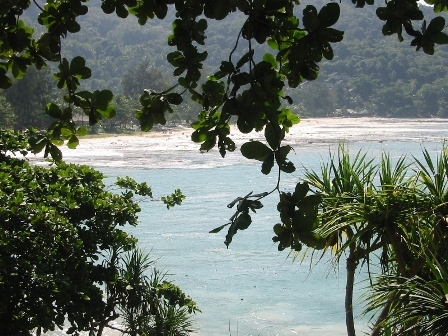 It is in just such waters that the Natewa Bay resort plans to build their "small islands". It is not clear if the resort plans to sell residential lots on those proposed islands or to simply use them for recreational purposes. If those islands are inhabited, the residents will live on "borrowed time", obliviously waiting for the day when an unexpected tsunami wipes them off the face of the earth. Even if uninhabited on a continual basis, the constructed islands would represent a threat to the existing coral reefs, by outright smothering during the building process. Additionally, any future tsunami would have the effect of dispersing soils throughout the sensitive native fishing grounds and coral reefs at the head of the bay. Natewa Bay is not Disneyland. It is a nearly pristine aquatic environment that deserves to be preserved for all, not just for the misguided, wealthy few who demand that their environment be altered to fit their sensibilities. If given the opportunity to see the potential destruction that their "innocent" purchase of a vacation paradise in Fiji might cause, my guess is that they would choose to buy property elsewhere or demand to see maps of potential tsunami destruction areas before they contracted for a land purchase. Is anyone going to demand that the tsunami threat to Natewa Bay be fully assessed before "small island" construction is approved or are we, the citizens of the earth content with saying, "It couldn't happen there"? Ask any survivor of the 2004 Indian Ocean tsunami. They will tell you that, "It can happen here". View the Google Map of Natewa Bay. Author's Note, August 2012: The website for the "New World Group" listed above is now offline. By LMC on October 5, 2012 09:43 AM | Link to this comment.